Hungarian merchant, journalist, and chess-master; born at Presburg April 6, 1837; died at Vienna April 30, 1889. Both in business and as a chess-player he was eminently successful. He founded the Wiener Börse-Syndikatskasse in 1869, and in 1873 established a commission house in Paris; and by prudent management he acquired considerable wealth. As a chess-player Kolisch soon became known for his brilliant and aggressive style, but he was not a frequent participant in tournaments. In 1860 he won the first prize at the international tourney held at Cambridge, England; in 1861 he lost a match with Anderssen, the strongest player of the day, by one game only; the same year he drew a match with Paulsen; and in 1867 at the Paris tournament he secured the leading position, defeating both Winawer and Steinitz. 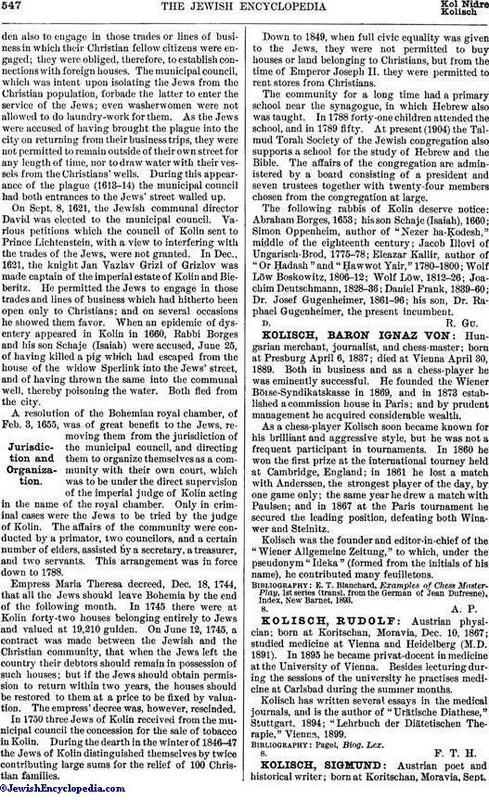 Kolisch was the founder and editor-in-chief of the "Wiener Allgemeine Zeitung," to which, under the pseudonym "Ideka" (formed from the initials of his name), he contributed many feuilletons. E. T. Blanchard, Examples of Chess Master-Play, 1st series (transl. from the German of Jean Dufresne), Index, New Barnet, 1893.